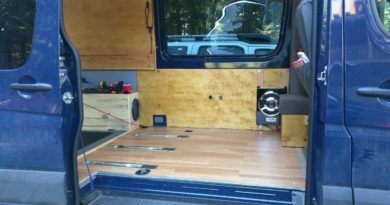 As we wind down on the primary build elements of our Adventure Van build, this page serves as a kind of catch-all for all those other items and ideas added to our van build that don’t fit into other build categories (at least not yet, anyway). 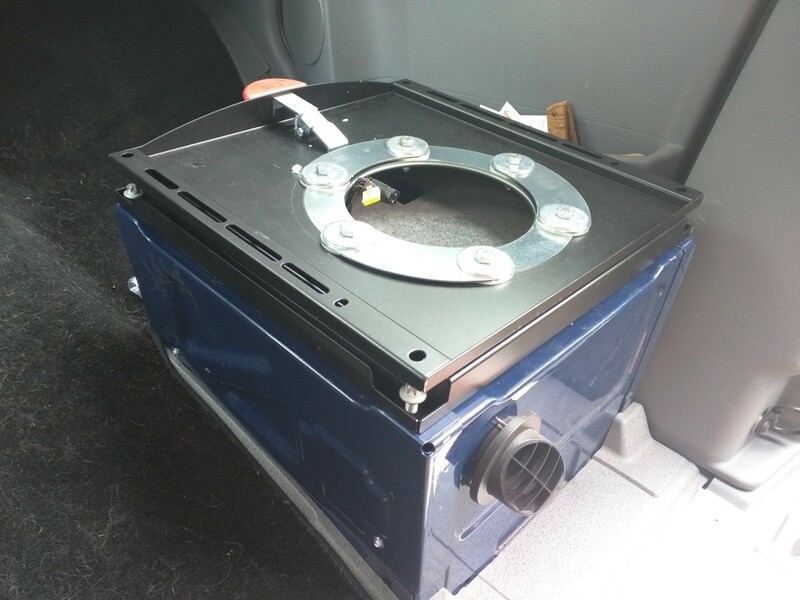 12V Refrigerator: We opted for the 2.2 cubic foot (61 liter) Dometic 12V Electric Cooler Refrigerator. We did this mostly for cost savings reasons. Other brand names like the ARB or Norcold were significantly more expensive. And I didn’t find any reviews that indicated one brand was far superior to the other to warrant the price hike. 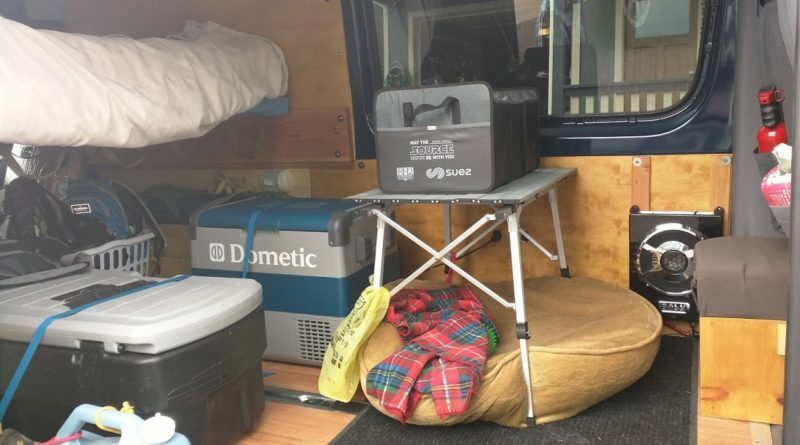 Overall we have been very happy with our Dometic cooler/fridge. It took a bit of figuring to get it to the right temperature. We found that with the freezer insert in, we had to set it to about 5°F to make things freeze in the freezer compartment. While when using the whole thing as a fridge we get good results with the thermostat set at around 33°F. The cooler/fridge appears to be very power efficient and even on some scorching hot days (100+°F outside) the compressor on the Dometic rarely runs while maintaining nice cold beer (and other things) inside. 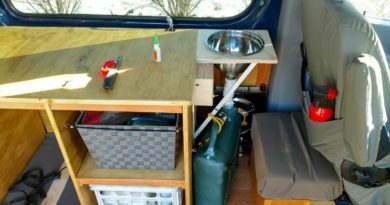 The size has been perfect for our needs – any bigger and it would be very difficult to move around – any smaller and I think we would have been left wanting more space for our typical 4-5 day trips. Little water pump: We wanted a way to get water into dishes and water bottles without having to pick up a large jug of water and carefully pour it into those items. I looked around for a while to find a foot pump that would serve this purpose but couldn’t find anything that looked reasonable (if you’ve found something, let me know in the comments!). What we settled on was this little self priming diaphragm pump. I attached it to a spare 12V+ cigarette lighter style power adapter I had lying around and built a little wooden box for it. For the price it was worth just trying it out on the off-chance that it would work out. Once connected to some plastic tubing, it works wonderfully to prime and pump water out of our large water storage jugs. Still a work in progress on where to permanently mount it (our kitchen area is still a work in progress) but so far using it as a temporary measure has been very successful. Carbon Monoxide Detector: This is an obvious must have for cooking with gas in a small well insulated space. We purchased this pretty inexpensive model based on its okay reviews online. It appears to work correctly but also likes to go through batteries a little faster than we would have liked. It may have just been a bad first battery though, so I will keep you posted as to how the next round goes. In addition to the CO detector, a fire extinguisher is another obvious must have. 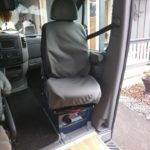 Swivel Seat: Why we didn’t install a swivel seat sooner I have no idea. I guess I read too many reviews that indicated all kinds of issues with the swivel seats. 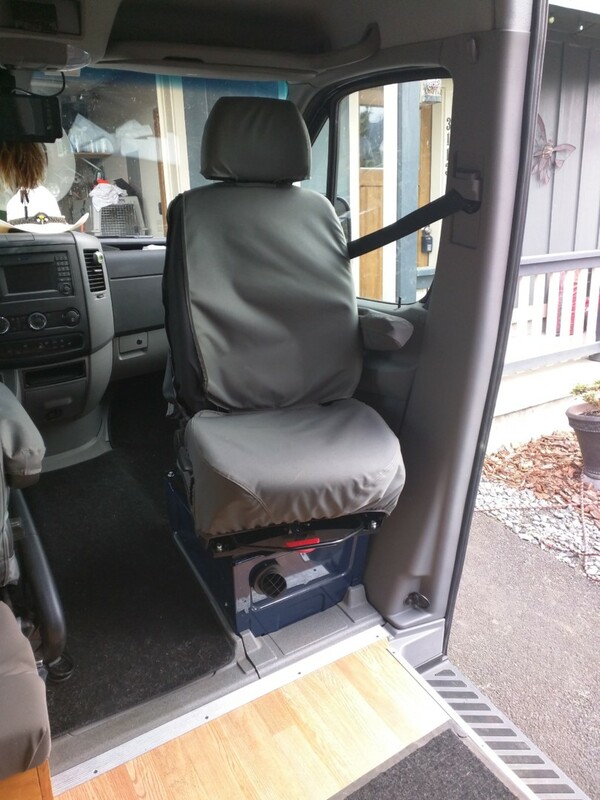 In the end, some friends of ours showed us there super awesome swivel seat from SwivelsRUs and sang their praises – so we bit the bullet and placed the order. About a week later the swivel showed up in the mail and 30 minutes after that (yes, literally 30 minutes from unboxing to installed and done! Easiest project ever!!) we had a passenger seat that swiveled. Works fantastically and I am very happy with our purchase. 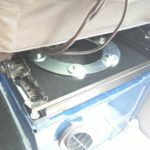 I had read horror stories about bolts not lining up or things being wobbly – that was not the case in our experience at all. Things went together very smoothly. Insulated Window Coverings (reflectix): We built our winter time window coverings out of excess Reflectix. We had ordered so much extra that we had to come up with some uses for it. It has worked fantastically for this purpose. We used magnets duct taped to the Reflectix to provide the attachment point to the van windows. 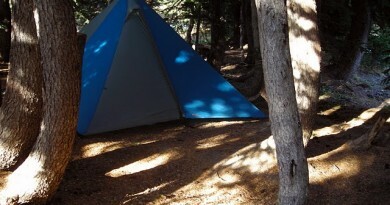 It has proven to be very effective for insulation in both hot and cold environments. We have “magnetized” Reflectix cutouts for the rear windows and side windows. For the front driver and passenger windows we just made a little duct tape tab that we close into the windows to hold those coverings in place (not ideal cause you have to turn on the van to open the windows. And finally, when very large Reflectix cover across the front windshield with a notch cut out for the rear view mirror that is wedged into place and held down by flipping the sun visors down. Works extremely well! Its just that tiny piece of metal that gets taped (using super bomber 3M tape) to the upper sliding door rail. But it does work really well. 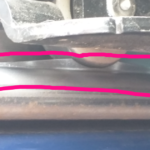 Here the van is parked at an angle and the intermediate door stop still catches the door and holds it in the intermediate position. This is super handy. 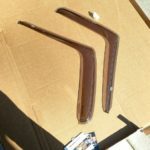 Intermediate Door stop: Okay – first why do you want an intermediate door stop? 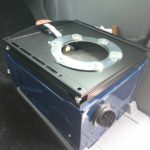 Because the van door opens very wide and though half the time that is awesome, the other half the time you don’t want to let all that warm air out of the van or all those bugs in from outside. The intermediate door stop gives you an intermediate spot to open the door to. It holds the door in that position but can be easily ‘pushed through’ to open the door to its full width. 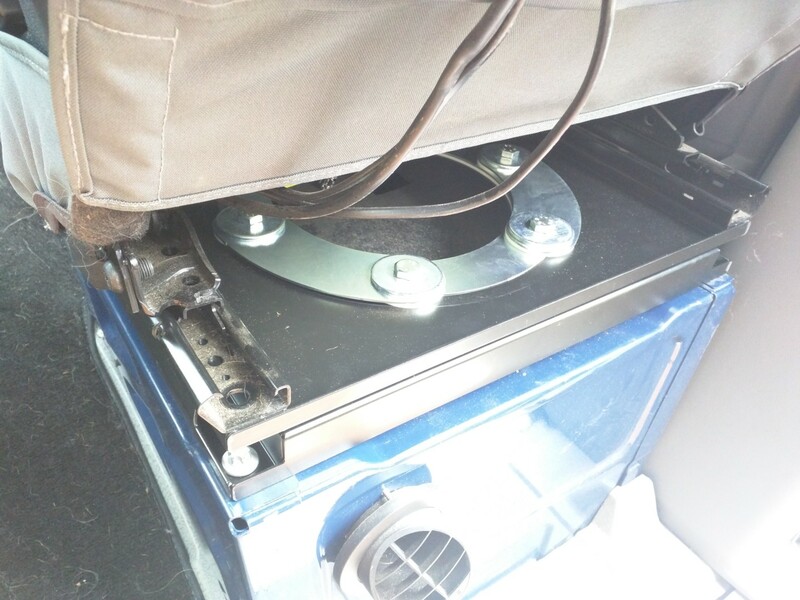 I’d love to tell you that we came up with some ingenious way of making an inexpensive, highly functional intermediate door stop for our van. I thought about it a lot – even came up with a couple wooden concept prototypes. In the end nothing I could come up with seemed better (and easier) than buying something someone else had already made. We ordered our intermediate door stop from Norton Fabrications. Installation was super easy, following the very well written instructions. The kit came with everything we needed for install, and though the door stop is really expensive for the tiny piece of metal that it is, it does work extremely well. Overall I don’t regret forking over the cash for having this essential item just be done. Rear View Camera: RearViewSafety. 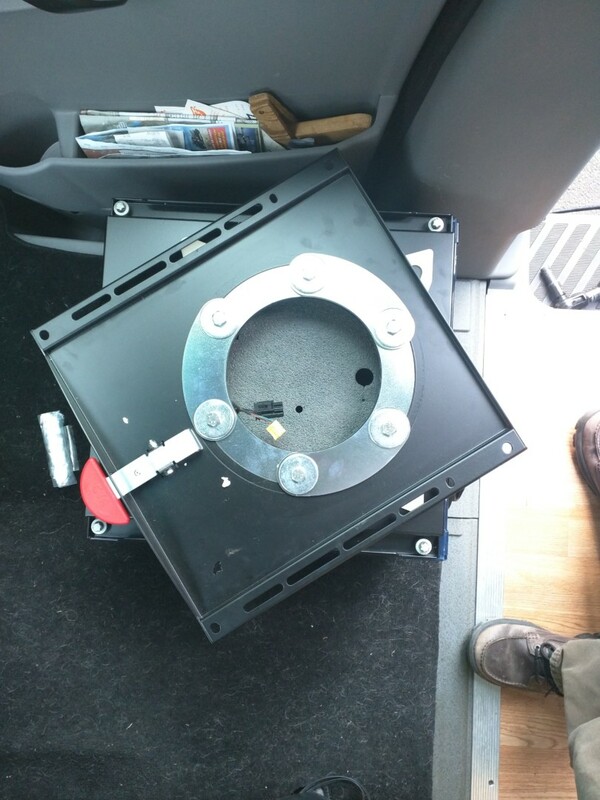 Part number We ordered the complete backup camera from RVS-816619. In a couple vans that we had test drove, the factory rear view camera didn’t impress us – it appeared to be pointed too far straight down, so you only saw what was directly behind you – and not what you were actually backing into. Plus, since we knew we were doing all kinds of other upgrades, running the wiring and everything for it didn’t seem to be that bad for the cost savings associated with installing it ourselves. 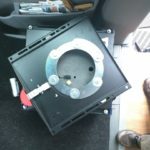 I was super impressed with the package – it came with everything we needed, cables, sealing gasket, etc. Installation was easy. 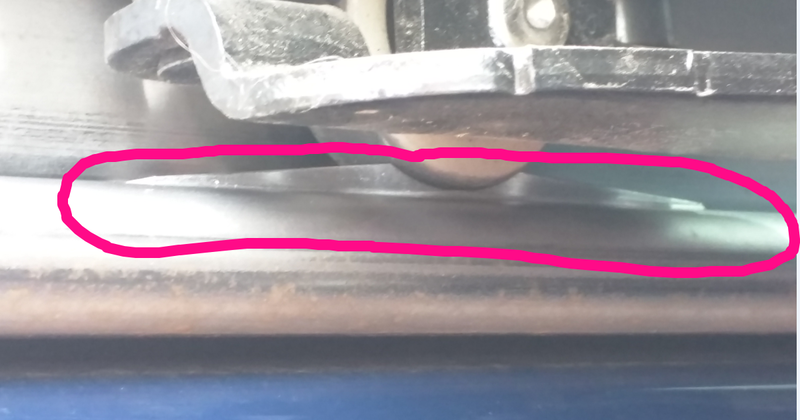 We wired our reverse lead to the white wire with blue stripe in the driver side pillar right next to the windshield. There is a wire bundle there with the white/blue wire in it (more info here, among other places). I used a wire tap to run a new lead back to the camera’s “multiplexer”. Overall really simple installation. And I was super happy with the camera. UPDATE: about 16 months in (and 4 months out of warranty) the camera broke. At first I thought it was something that I had done wrong, bad wiring or worn cables or something. But after taking everything apart and ordering new everything to troubleshoot the problem, it turned out to just be the camera itself. Not impressed with the longevity of this item – maybe I just got a bad one. Anyway, the prices on Amazon were $50 better than the prices at RearViewSafety for the camera alone (with cables), FWIW. 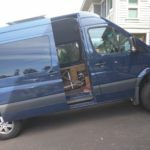 Side Window Deflectors: We wanted a way to have the windows cracked open, even when it was raining (because, lets face it, we live in the Pacific Northwest). 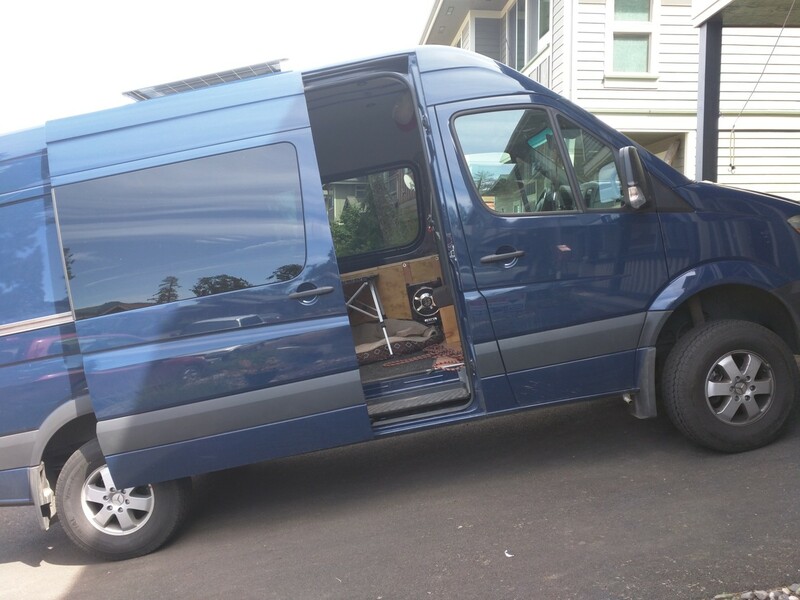 These window gutters or flares or deflectors worked out great for our Sprinter. 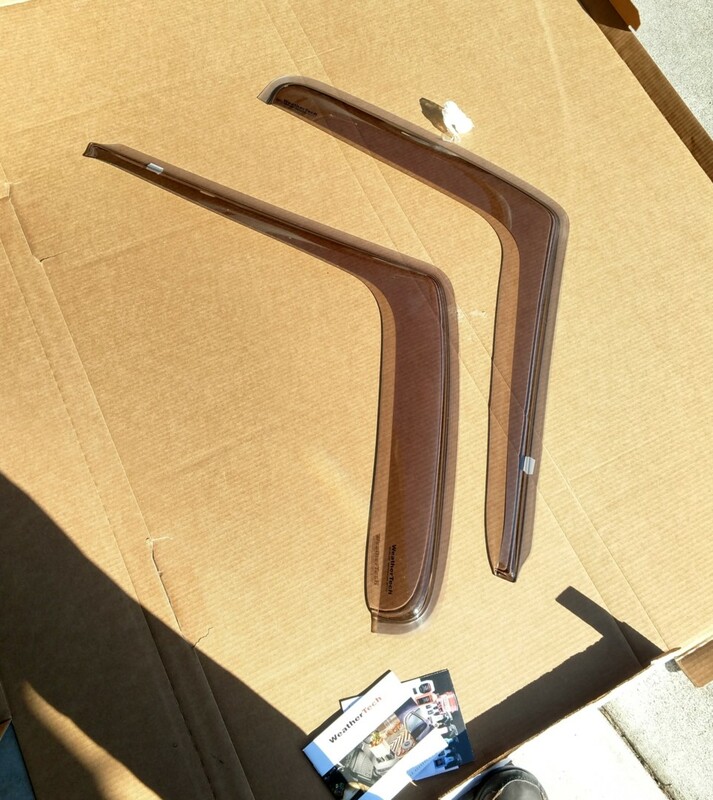 They are part number 70462 from WeatherTech. Installation was pretty straightforward. You carefully bend the deflector into position in the window opening. We did have some trouble closing the windows once they were installed. I was worried we were going to burn out the window motors. In order to get the windows to close the first time I had to kind of pull the deflector out and push it up to get it really well seated into the window channel while my partner closed the window from inside. We did this a couple times but it was still very sticky. I was concerned that we might never be able to open the windows again. But we closed them up and left it for a day in the sun and – wallah! – now it works like a charm. Windows go up and down easy and the deflectors keep the rain out when the windows are cracked open. Its going to be great this summer. Note: we went with the “light” tinting. This seems to be pretty nice, since the deflectors travel down pretty well into your field of view. I think the dark tinting would have been too much. Clear might have been better, but might have also look strange. Hard to know, since that’s not what we did. Overall I am very happy with this product. 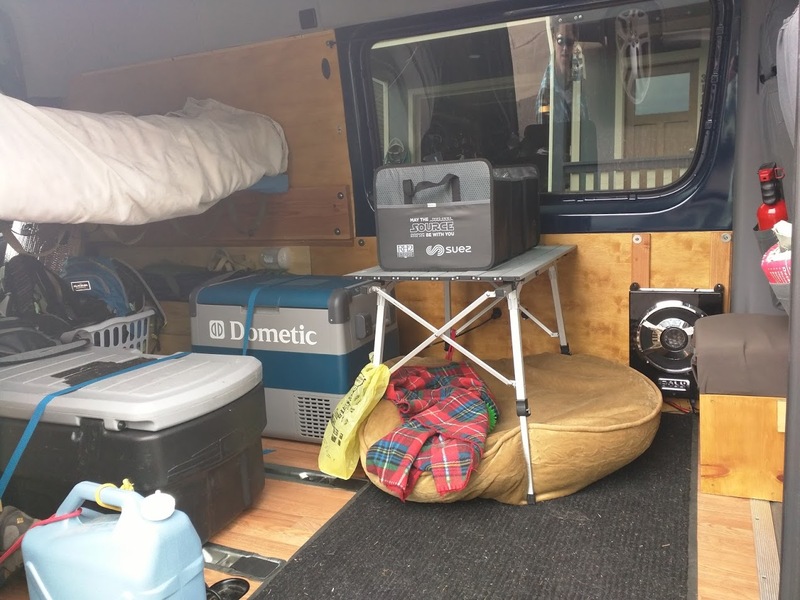 Other Upgrades and Accessories of Note: Alarm System, Lighting under the bed platform, racing stripes to hang stuff from the ceiling… more to come, I’m sure.